Twiggy and Opal: Printology :: Plus A Giveaway! Printology :: Plus A Giveaway! I was asked if I would like to join the fun in showcasing a new fabric line from Benartex called Printology. 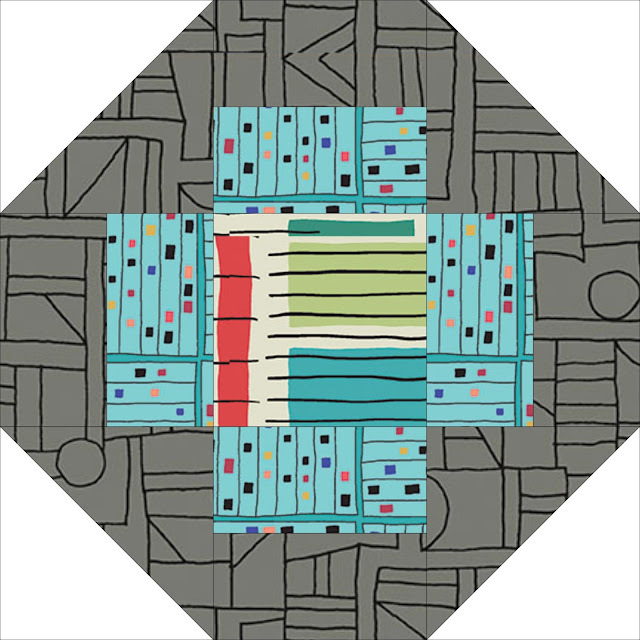 The fabric is the newest collection from Weeks Ringle and Bill Kerr (Modern Quilt Studio) and was inspired by their recent trip to Japan. 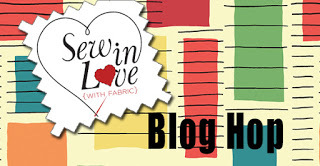 The Sew In Love blog has a wonderful interview with both of them where they talk about their inspiration and thoughts about this collection. The collection offers a fun and modern mix with loads of color! When I first saw the collection I felt it had a funky retro vibe to it. Which drew me in and got my wheels spinning! 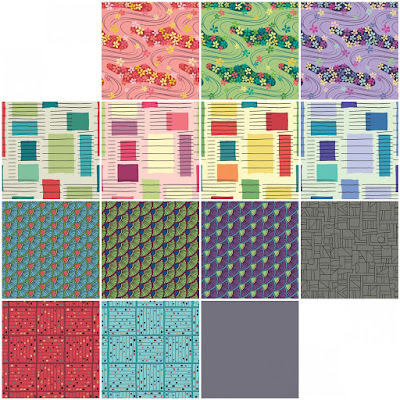 Which brings us to the quilt I made using the Printology Collection: 'Reviving Retro'. Retro basically means 'style, fashion or design' from the recent past. The fabric and a classic Grecian block bring both worlds together, yet still has a modern vibe. These are 22 different prints in the collection, I only used 13 along with white and grey solids! The prints in row two, Blocks, is where I got the retro vibe from. They would make the perfect center squares for the block. I like how the graphic Sketch Gray frames the centers. I added 2" sashing and a 3" border in Gridwork Red. It adds a big pop of color without over powering the other prints. I quilting the center blocks using different widths of straight lines in grey (surprise! ), depending on which way the lines are going in the 'Block' print. Again, straight lines in the sashing and border using red thread. I used more Gridwork Red for the binding and really like the look of the white corner squares framed by the skinny binding. The fabric feels amazing, by the way! The 'proof in the pudding' as they say, has to be the ease in which the needle glide through the fabric while had stitching the binding to the back. Like butter! It makes for a pretty package don't you think?! Which brings me to the giveaway! Who would like to receive a pretty fat quarter package all their own?! Benartex is generously donation a bundle of 8-10 prints from the Printology collection to one lucky person! To enter, leave a comment on my blog...any comment is fine, but if you'd like to tell me your favorite classic block...that would be good too! Using the Random Number Generator, I'll pick a winner on Sunday May 13th and notify the lucky person via email. So be sure you include your email in your comment if you are a no reply blogger! For more inspiration using Printology, check out Heather at Quilt-achusettes and Alison at Little Bunny Quilts! My favorite classic block would have to be the Log Cabin. The variations of that block can go on forever! Great quilt, Jayne. I love the final folded version! I honestly can't pick a favourite or is that just a cop out? My favourite block today is the simple 9-patch. Just about the first block I ever made and so versatile depending on fabric placement, alternate blocks etc. I'm not sure if I have a favorite. If I had to day it would be 9 patch. What beautiful fabrics! My favorite block has always been churn dash. Thanks very much--I always enjoy your blog. Oh, please, I want some of that! My favorite traditional block is Ohio Star. I love evening star blocks! Gorgeous fabrics! My favorite block is the pinwheel. Log cabin blocks are a favorite of mine. So versatile! Your quilt looks fabulous, I love the retro vibe. Churn dash is my favourite traditional block and the wonky star is my favourite improv block. That fabric is so cool! I have a friend who is into all things Japanese and she's pulling me into that world too..really really like the designs! I am a sucker for most star blocks. Thanks for the giveaway! I've always loved the Churn Dash blocks. That's a fun quilt, Jayne! I especially like the red print you used for the sashing. Thanks for the great giveaway! My favourite classic block is the Dresden plate. Thanks for sharing. I really like the funky, retro vibe of Printology too! You used it so well to show off your quilt! 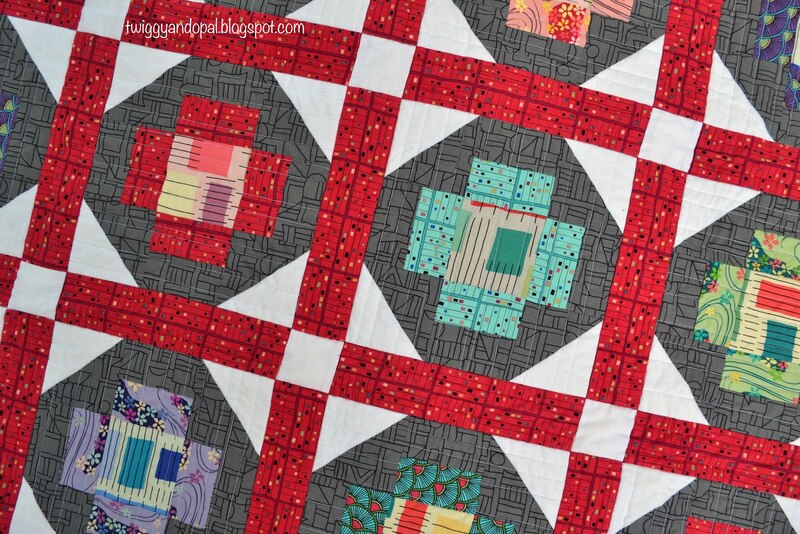 I've always admired pinwheel blocks as they remind me of happy childhood days, always waiting for a breeze! I love flying geese! Thanks for the opportunity to win these beautiful fabrics! I adore log cabin blocks. You can do so many different things with them. These fabrics look like fun and I'd love to win some. My favorite block would be the Dresden Plate. What an amazing print pattern! I love the colors you picked to help compliment this design, thanks for the share. Keep up the posts, hope you have a nice rest of your week! I love making traditional blocks with modern fabrics. And wouldn't my favorite, "Farmer's Daughter" look great in this collection? My favorite blocks are those with pinwheels, I also like stars. 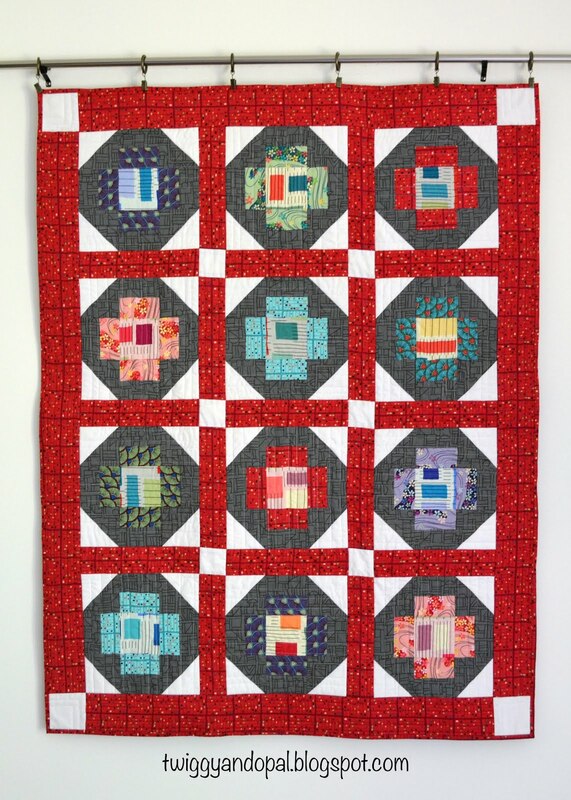 Love the use of the colors in your quilt. I love that block! It has a special place in my heart...and to do with Benartex too! My favourite classic block would be any kind of star, and also the school house block. Great job on the quilt Jayne! I love friendship stars and churn dash blocks. Your quilt is so fun, too! Very beautiful quilt. I like simple squares with frames. It's a fab quilt! I love the Flying Geese block, any interpretation of it, it's so versatile. My favorite block is Double Wedding Ring, but I love flowery appliques best. I love that Sketch Gray fabric. I don't think I have a favorite block. Love these fabrics. Hope they will be easy to find. My favorite classic block is the log cabin. Very beautiful and interesting quilt with all the different prints. I like many quilt blocks, hard to say just one. A cute quilt. as others mentioned, the Log Cabin is a favorite. It fits many fabrics. Hi Jayne, I really love your quilt - you have made wonderful use of that lovely fabric. The red and grey are very catchy. I'm not sure that I have a favourite classic block but the log cabin is always an easy and great one to use. Wow, love that fabric. I really enjoy making flying geese! Great quilt! I love courthouse steps/log cabins & the Weathervane block! I cannot limit myself to just one (of anything!) but churn dash is one of my favorite blocks. Love the Printology Gridwork Red and Sketch Gray fabrics, too. susanprincess at att dot net. I love what you did with Printology! 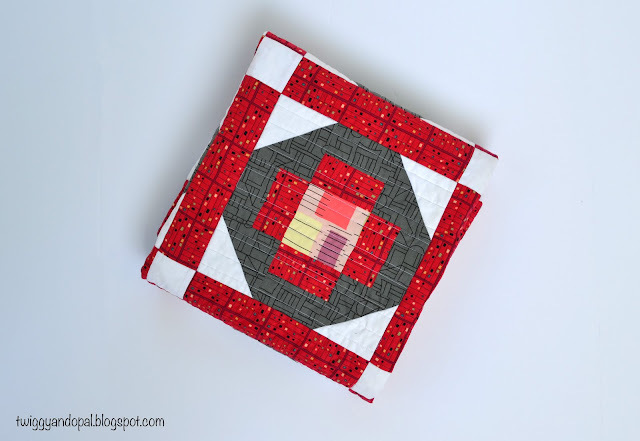 My fav quilt block these days is definitely the plus block, so you can see why I love what you did! I love all log cabins blocks! I love the way you have used this fabric. Especially the blocky prints in row 2. My favorite print in the series is the red border fabric. It has been fun to see the new quilts designed for use with this line of fabric. Thanks. Wow! Your quilt is really beautiful. I love it. My favorite block is the Dresden Plate. Thank you for the giveaway. my favorite block is the friendship star. thanks for the chance to win. This is the first year I have ever paid any attention to using grey fabric in a quilt. Yet, I have fallen in love with it and the grey you chose for the blocks in this great quilt really pops with the red and white. On top of making the fabrics inside look so much brighter. The sashing red fabric is perfect! This is a fantastic quilt; I wish I could pair fabrics like this. Thank you for sharing your fabulous quilt with us. My favorite quilt block is the Jacobs Ladder Block which I also just discovered this year. Have a great day! I love making any star blocks!! Oh, and sampler quilts ! I love these blocks. And the printology fabric is beautiful. My favorite block is the Ohio star. Your quilt is outstanding! I still favor the nine patch block. Great quilt and thank you for the details. I really don't have a favourite retro block. My favorite block (this week at least!) is the chunky churn dash. Thanks for offering this giveaway! Love this fabric! My favorite block is Churn Dash--same block as Grecian with a different arrangement of the colors! Beautiful work. Your quilt showcases the fabric designs. I really like the dresden plate, it's been a favorite for a while now. Love that red sashing!!! Hard to pick a favourite classic block, but when pushed I’d say the Ohio Star! Who doesn’t love a star block? Although I struggle with making them even, I love Flying Geese. They make great stars and can add movement and whimsy to a quilt. These days I am all about the Nine Patch and its variations. I've been making what I think of as "Pioneer Quilts" and I'm crazy about their simple charm. Great quilt! My favorite classic block is the Churn Dash. I guess the Nine Patch, but lately I've been looking for any block that can nicely incorporate hand embroidery. Love your design! My favorite block is often a star of some sort: Ohio, Friendship, etc. Your quilt is great. I'm sure it's a challenge to get the fabrics and then figure out what to do with them! Thanks for sharing. I've always enjoyed Flying Geese. I like your quilt! Great use of the fabric, which is pretty cool! I have always been drawn to star blocks of any kind. Reviving Retro is beautiful, and so are these prints! Thanks for sharing this. My favorite blocks are anything with curves, such as drunkard's path. I like the log cabin block, I used it for my first quilt. I like the log cabin block. My favorite snowball is a great addition to most other blocks and can be made in so many "odd" sizes. Love that red gridwork fabric. I love log cabin blocks!!! Thank you! Flying geese. I don't like making them,but sure like looking at them. It's a tie- Ohio Star and Log Cabin. Each just make my heart sing! Love, love, love the red sashing. I never would have picked red, and it is just perfect! I love the Dresden Plate. I love your use of red for the sashing. My favorite block is Swamp Angel. It looks so great side by side bringing out a whole new pattern. I like the geometric prints in this collection and the color palette is quite pleasing. Hi Jayne-bug! I like the block Corn and Beans myself. Reminds me of childhood! Love what you did, very nice use of the colors in this line. I love so many blocks it would be hard to chose just one. thanks for the chance to win. What a fun quilt! These prints are crazy beautiful. I love me a classic churn dash - which is a variation of the greek cross block you choose anyway. Love the retro vide. Monkey wrench is my favourite classic block. What a fun quilt and I love how you used the fabric. For me it's Granny Squares. They have always been a favorite. 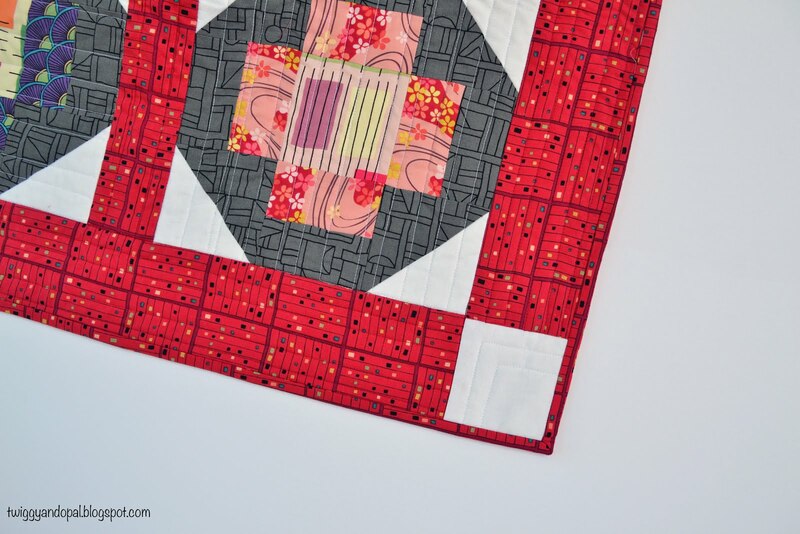 The red in your quilt really sets it off--one of my favorite blocks is Churn Dash. Bear paw is my current favorite block. These fabrics look great in your project. I love the red sashing in your quilt! My favorite retro block is the Hunter's Star. Thanks! Churn Dash fan, since I finally made one for a sewalong. Grecian block looks classic too....I'll have to try that soon. Loving your straight line quilting Jayne, now that I can do! Thank you for sharing your techniques, back and front. Love your quilt! I don't have a favorite block right now just loving most all of them. I loved the Log Cabin Block. I have made a 12 Block Paper pieced wall hanging. I would like to repeat doing this again. I love your quilt and would love to win the fabric! One if my favorite blocks is the churn dash. Thank you for this giveaway! I like the rail fence block. 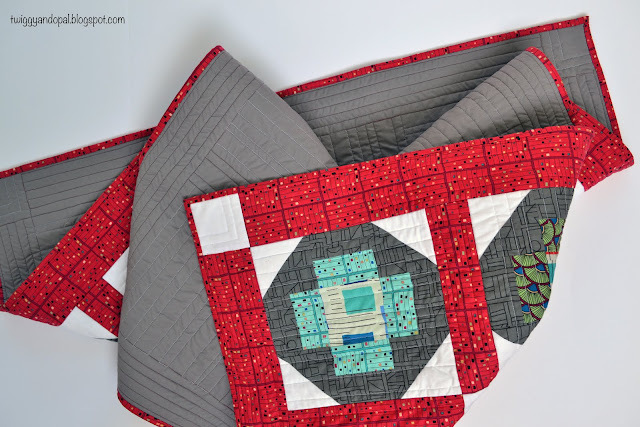 I love the churn dash block, lots of possibilities there ! Another great finish. Well done. This is a great fabric collection. Great design for those fabrics Jayne. My favorite block is probably a churn dash. Thanks! Favorite classic block? That’s a poser. I don’t think I have one thigh fwiw I can say that I don’t like Star blocks. They all scream county to me, no mater the fabric. Love to make the 9 patch in different variations. Beautiful quilt! I really like the red sashing and how it plays with the blocks. One of my favorite classic blocks is the Ohio Star.